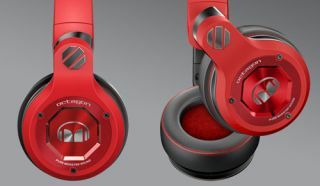 Monster launches Pure Monster Sound, joins forces with Adidas, Lamborghini and UFC | What Hi-Fi? Monster always makes plenty of noise at CES and this year was no different, with 'Head Monster' Noel Lee – resplendent on his gold Segway – revealing tie-ins with Adidas, the UFC, the World Poker Tour, Lamborghini and any number of US music stars. There was also time to mention Monster's new Pure Monster Sound seal of sound quality approval, a host of new headphones, including the DNA Pro Wireless, and even a return for Monster's "retro cables", which of course the brand was built upon. Arguably the company which pioneered the celebrity tie-in, Dr Dre seems a distant memory for Monster, who now have the likes of Nick Cannon, Shaquille O'Neal and UFC fighter Anthony Fettis. The main new headphones were the DNA Pro Wireless over-ear headphones, which have wireless aptX Bluetooth, active noise-cancellation and "buttonless touch-sensing control". There's the option to have a wired connection if you prefer and you can charge the cans via USB. Available in Q2 2014, the Monster DNA Pro Wireless headphones come with a $450 price tag. Also new were the Monster Octagon headphones, the new official headphone of the Ultimate Fighting Championship (UFC). UFC is the fastest growing sports organisation of all time, according to Monster, so having cornered a certain corner of the music market, sports seems to be next. The tie-in with Adidas, which will see Adidas Originals headphones in 2015, is also part of this strategy along with Monster becoming the official headphone supplier for the World Poker Tour – "the only sport you can play with your headphones on". Monster always has an eye on the money no object market, and the Lamborghini relationship is the ultimate example. The Lamborghini Veneno Roadster, the world's most expensive production car, will now come with a High Performace Audio by Monster in-car sound system. The car costs over £3 million and only nine will be made. What's more, we hear a rumour that there will also be Monster Lamborghini headphones in the not-too-distant future.